St. Joseph Catholic Church, Monticello, UT. Cherry and travertine furnishings. Hand milled architectural millwork. Altar, ambo, presider's chair, deacon's chairs of cherry and travertine. Hand carved and painted San Damiano crucifix from Italy. Altar and ambo of cherry with travertine panels. 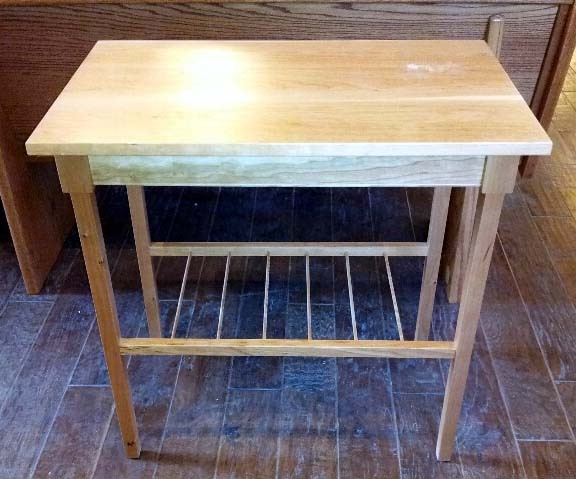 Altar of cherry with rough hewn travertine mensa and panels. Ambo of cherry and rough travertine. Baptismal font of cherry and travertine with hand cast glass basin with underlighting. Arched panel with hand carved mahogany frame. Tapistry from the Cathedral of Our Lady of the Angels in Los Angeles. Hand carved mahogany frame. Tapistry from the Cathedral of Our Lady of the Angels in Los Angeles. Oils ambry of cherry and walnut. Presider's and deacons' chairs of cherry. Blessing font of cherry with hand cast glass basin. Hand carved mahogany frame. Canvas from the Basilica of Our Lady of Guadalupe in Mexico City. Hand carved mahogany frame. 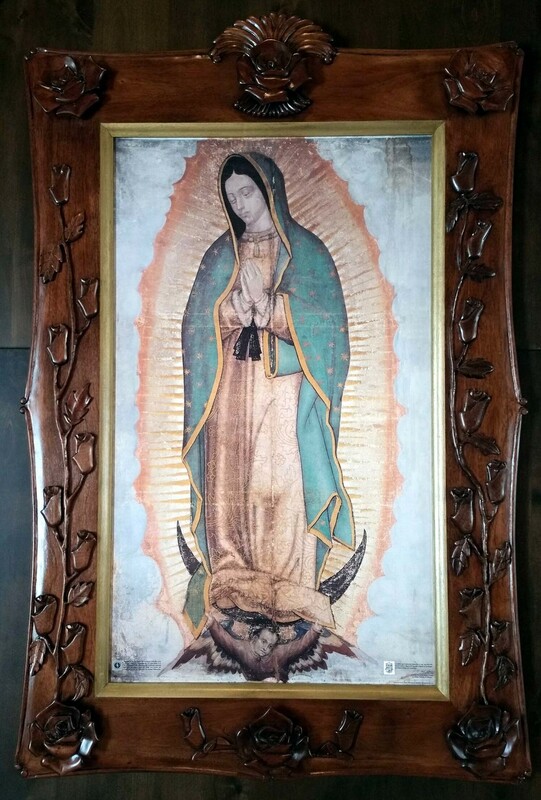 Canvas from the Basilica of Our Lady of Guadalupe in Mexico City. Arched millwork panel with travertine shelve for candles and flowers. 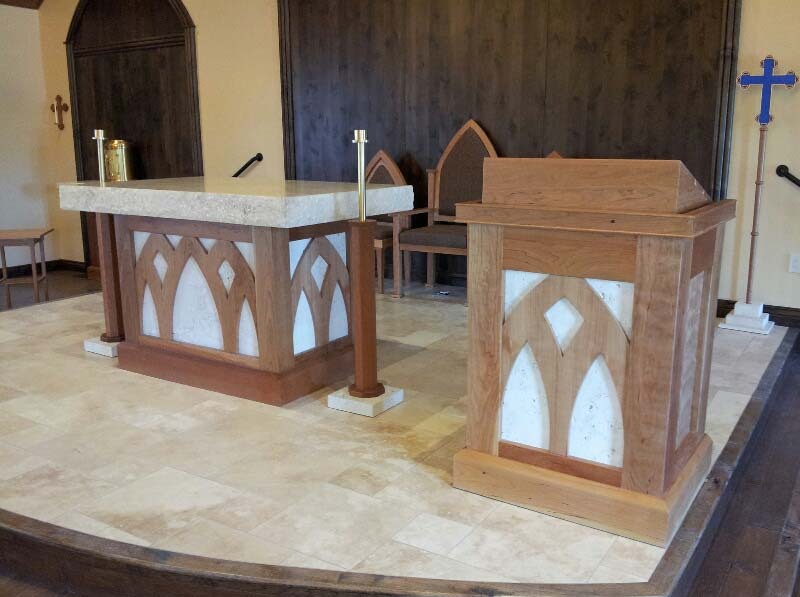 Tekton Woodworks designed and fabricated all the liturgical furnishings and architectural millwork for St. Joseph Catholic Church in Monticello, Utah. Materials are clear cherry and rough travertine.